From the turnoff to Laguna Chapala there is that nice graded section for about three miles before it deteriorates into a pot-filled washboard to where the ‘new’ road will come in. (The turnoff to first bridge is being graded and has the gravel layer down but not open). Next several miles are light gravel then it is on to the washboard. Big quality reds are still showing in the area to the north of North Island. 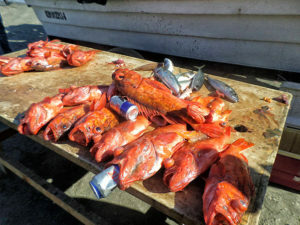 The Rock Piles are holding nice 2- to 5-pound reds, scattered about in 300- to 475-feet of water along with some nice chuckleheads, a few boscos, some 2- to 8-pound bocaccio, and other assorted rockfish. Fresh, dead or fresh-frozen squid have been working best but some boats are doing okay with the sardine and anchovy as well. The big yellowtail are mostly 6- to 12-pound fish mixed in. Not a lot of surface indications on these so you’ll want to use your sonar or troll Rapalas to find them. Once located dropping a yo-yo iron and dropper loop bait is working best on most of the fish, but they are responding to chum and can be taken with the surface iron or flylined baits. According to several boats it has been windy and rough recently, but the bass have wanted to bite anyway. 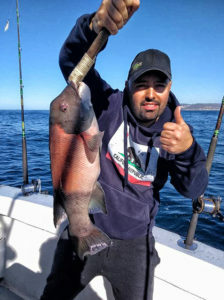 Anthony Motshagen had an excellent bottom fishing trip with local Panguero “Charley”. 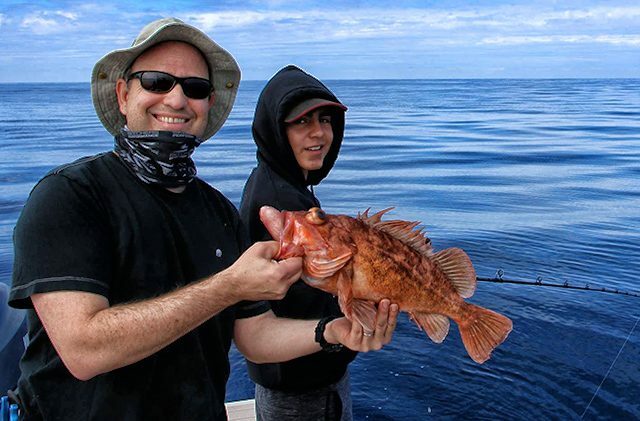 They launched directly on the beach and after a 20-minute boat ride, they were on the favored high spots that produced lingcod and reds on 300- to 400-foot pinnacles. sea life cavorting in Todos Santos Bay. 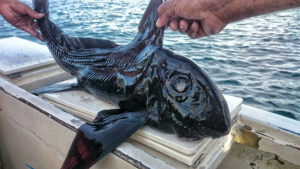 However, the few serious fisher folks who fished the bottom got either limits or near limits of tasty lings and sheepshead, along with some keeper reds to adorn the dinner table. One group that chose to remain closer to shore, drifted for halibut in the shallows over the sandy bottom and were rewarded for their efforts with a few “keeper” halibut for the cooler. 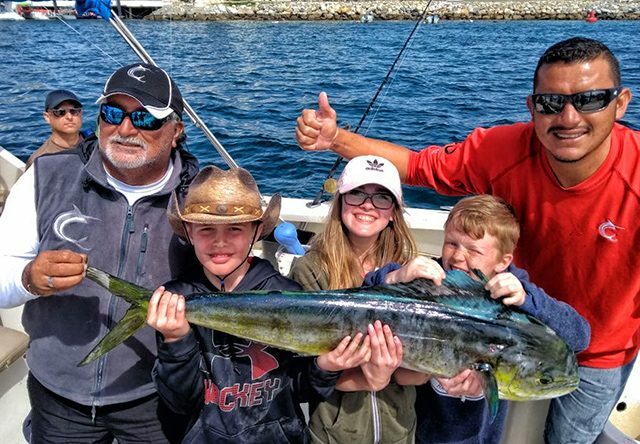 It’s still early, but there is a little bit better grade of big yellowtail, calicos and some large barracuda down off Todos Santos; if the incoming weather doesn’t stop these fish we may see them slide up the coast into the Coronado Islands area soon. Although the high spots remained productive the recent rough weather caused most of the 1½-day boats from San Diego to decide not to schedule trips, as did some of the larger local fleet boats. However, offshore some of the yachts traveling up and down the coast have reported bluefin sightings from Cedros to the Mexican border. 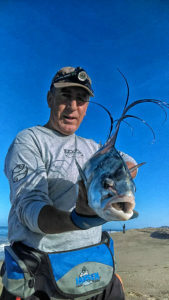 These reports were underscored recently by Captain Brian Kiyohara aboard the long-range, American Angler, on a straight line course for San Diego above Cedros where he reportedly observed over 30-plus miles of bluefin jumpers and small schools on their sonar. Sounds like another early offshore bluefin season may be coming our way! to where the ‘new’ road will come in. (The turnoff to first bridge is being graded and has the gravel layer down but not open). 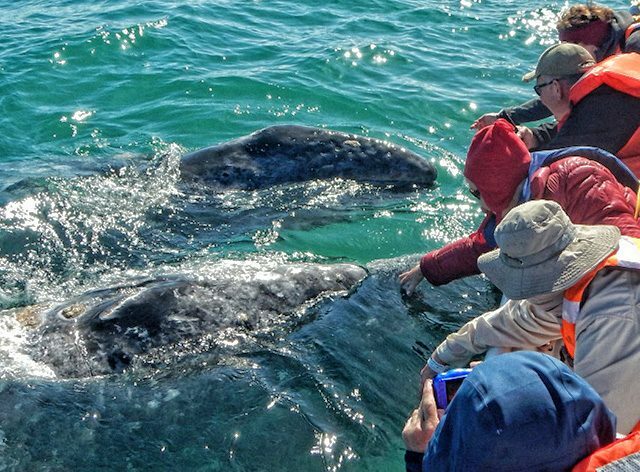 We are in the height of the tourist season with 9 out of 10 boat trips doing whale watching. I was out on the water to confirm the action this week and found most of the action is moving from one rock pile to the next. We tried three proven spots that both the sport and hand-line fishermen routinely hit. Live bait, iron and the down rigger was good for one hit with a break off. All the boats spent about 20 minutes, then pulled out to another spot. When you see the commercial hand line guys moving you know it is SLOWWW! I have to chalk it up to the February “Blues”. March will have a change with the wind improving and the yellowtail swarming with their mouths open. Pintos, triggerfish and a few pargo are always in the mix but it’s a bumpy cold ride and a hundred dollars for gas…I’ll wait a few more weeks! Kathy Hunter, Bakersfield, Calif. and Angela Whitecare, San Diego. at Cerralvo, as well as some sierra and roosterfish from the shore. Many disappointed kite-boarders gave up and headed back north in disgust as the windy conditions they came for failed to materialize. In the twinkling of an eye the North Wind arrived with its chilling effect and wind waves were crashing on the sandy beaches. Locals began appearing on the beaches for their morning walks bundled up in sweat shirts and pants. Sportfishing was required to take a breather and endure the grumpy seas that prevented all but the hardest core of anglers from doing much more than talk about gigantic humpback whales cavorting in the wind waves not far offshore. 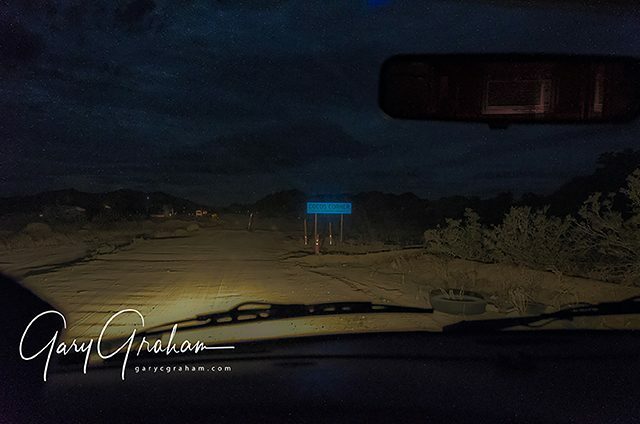 However, the locals are reassuring each other as well as the arriving guests that it will only be a few weeks, and everything will be back to normal. The operative word here is “normal”. North winds and East Cape in the winter go together like chips and salsa. So to be on the safe side, I would imagine it fair to say, expect some continued sporadic windy periods for a few more months. Recently, we saw a slight increase in the number of anglers arriving. We have become accustomed to the ongoing wide range of unpredictable weather patterns. Despite the cooler conditions, the ocean has remained relatively warm, now averaging 70 to 74 degrees, very clean and blue close to shore, but with strong currents running though. Lots of jelly fish in the area now, and a continued large presence of whales; of course, those pesky sea lions have been robbing their share of the catch. Sardina continue to be the main bait being used and schools of sardina are found off the beaches from Palmilla to Cabo Real. They are also being found off of the rocky beach stretches north near San Luis, where there are a larger grade of these baitfish. Other options have been slabs of squid on some days, and varying quantities of mackerel were being jigging up on sabiki rigs, mainly off of Punta Gorda. The highlight this week was that the yellowfin tuna which had really faded out, rebounded as water conditions have actually improved, despite the cooler weather patterns. 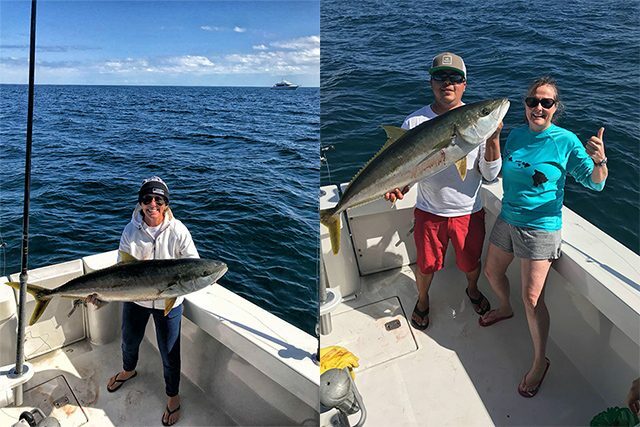 Fleets found decent yellowfin action near Vinorama ranging in sizes to over 50 pounds — quality tuna considering that this is never known as a favorable time frame for this pelagic species. The fish were striking on sardina, strips of squid, as well as on mackerel when they were able to be found. Boats were averaging from one or two to six fish per morning. Dorado was another common fish found. Most of the dorado were under ten pounds, but there were some larger fish, including a true 25-pound bull dorado. Many people are releasing the smaller dorado, especially the females; remember to practice the conservation of these juvenile fish to help maintain future stocks. Not much in the way of billfish action off San Jose del Cabo at the present — better chances are on the Pacific side now. We heard of a blue marlin being landed, but the striped marlin is the most common billfish being caught this time of year. Bottom action has been limited with not much besides a scattering of cabrilla (leopard grouper), pargo and triggerfish; swift currents have made bottom fishing tough and most charters have been going after the tuna and dorado, or they were fishing for sierra along the beaches. Numbers at a glance: Billfish 70%, Tuna 0%, Dorado 37%, other 20%. This week the marlin numbers jumped back up again, with 70% of the boats catching striped marlin. Dorado numbers remained strong, but the tuna was nonexistent. Fishing was a little tougher this week … not as consistent … but those that did find fish, found many, with top boats catching up to six striped marlin each. 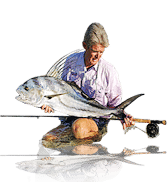 Cabo Climate: Overall great fishing weather – it is the early dry season – with sunny to partly cloudy skies, average and daytime temps in the upper 70s with evenings in the mid-60s. More of the same expected through the start of the new month with a few days of early morning showers predicted over the first couple of weeks of March. Winds are relatively calm with gentle shore breezes in the mid- to upper-single digits. Humidity expected in the mid-60s for the early weeks into March. Sea Conditions: Relatively calm seas throughout the area with some surface chop occasionally stirred up by surface breezes at 8- to 10-mph mostly out of the West and WNW. Forecast is for more of the same with winds in the 8-mph range increasing to 10-mph going into March. Sea temps around the Golden Gate and Jamie Banks steadily cooling into the lower 70-degree range. 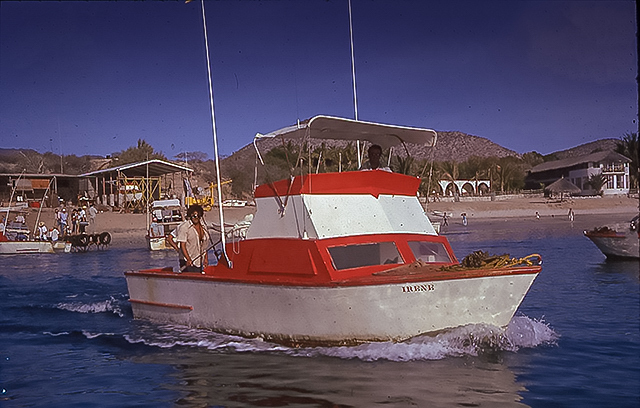 Water around Cabo Falso east to the Gorda Banks is warmer in the 73- to 74-degree range. Best Fishing Areas: Boats making the run to the Golden Gate continued to be rewarded with solid marlin action. Most of the boats fished a little closer in and were finding marlin in the El Faro and Pozo Cota areas. Action along the Migrino slowed considerably with the catch shifting to more bonito than dorado. Best Bait & Lures: Trolled lures and rigged and live bait tossed to surface fish seemed to be the ticket for the marlin. Some boats mixed some smaller smoke trail and jet heads along with feathers to coax the dorado.